The Varian magnet is a solid pole electromagnet providing fields of 10 kG (1 T) vertically with 90 A; that indicates 111 G/A overall, but the response is non-linear depending on the saturation of the iron yoke and poles. Since the field is transverse to the beam direction, only high momentum backward muons may be used; and Varian is the only way to get such high transverse magnetic fields for backward muons, in the absence of spin rotators. Even with energetic muons, the beam is bent considerably, so the magnet slews sideways to catch the beam. 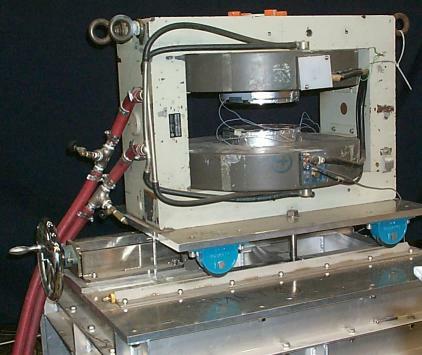 Cryostat access is horizontal, axial to the beam (either the incident beam axis or at an angle to match the bent beam).